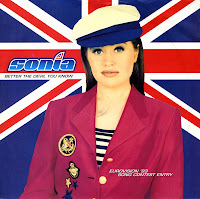 Not to be confused with one of Kylie Minogue's best songs of her career, this is the song with which Sonia represented the UK in the 1993 Eurovision Song Contest. She sang eight different songs on the national final, but this track, written by Brian Teasdale and Dean Collinson. On the night of the Eurovision Song Contest, she received the maximum 12 points from Belgium, Iceland, Austria and Israel. Amazingly, she made 2nd place in the competition. It may be obvious from my tone of writing: I wasn't impressed with this voice. It was just as uninspiring as that year's winner, Niamh Kavanagh's 'In your eyes' (Ireland). My favourite track, 'Alle mine tankar' by Silje Vige (Norway), ended up in fifth place.